I’ve been having an obscene amount of fun with the Media History Digital Archive of Photoplay! I think I’ll start posting some of my fanzine findings here, between those colossal (in length and jpg usage, if nothing else) King Vidor posts (I should get to The Patsy later this week). Today we have a pair of potted reviews dealing with Helen Chandler (a personal tragic favourite of mine) releases from 1931. 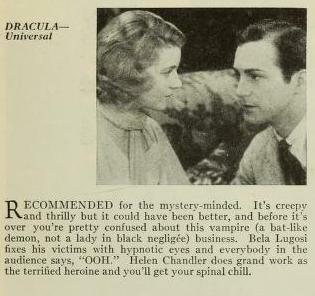 First up: Bela Lugosi’s magnificent Hollywood breakthrough (although you’d never know it from this still and write-up). I’ll be talking about this one at length during the course of my Laemmle Jr. Universal series. I guess vampires don’t cast their images in fanzines either? 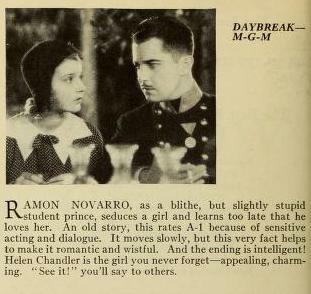 And second, one of my favourite early 1930s romances, Jacques Feyder’s criminally underseen Daybreak.